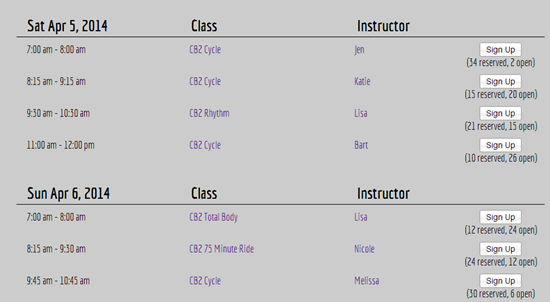 You are here: Home / Instructor Tech Help / Mr. Macgowan… you have a reserved seat on bike #18! Mr. Macgowan… you have a reserved seat on bike #18! How cool is this? I hadn't experienced an Indoor Cycling studio that offered reserved seats before. It had me feeling like a VIP when Amy and I visited CB Cyclebarn, Karen Casler's studio last month. 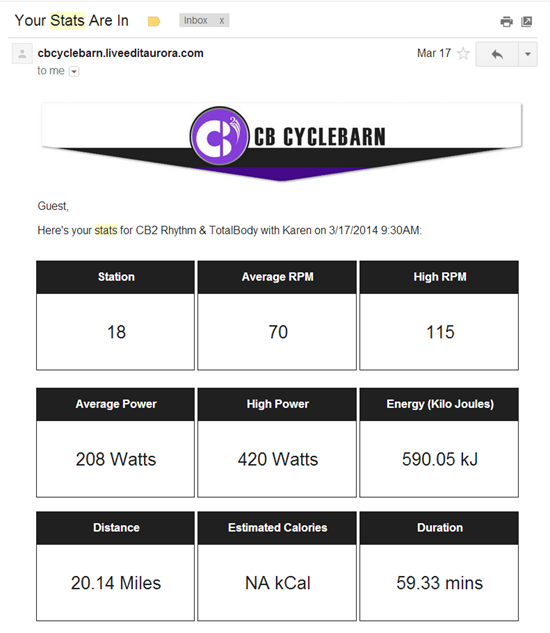 The website system she uses integrates her Mindbody account with the class rider data collected by Performance IQ. I thought you might like to see the string of conformation and followup emails the system creates automatically. First let's reserve a spot in the class. I didn't think to take a screen shot at the time so I'm showing tomorrow's schedule. Better hurry and sign up now for Jen's 7 am class! There's only 2 spots left. Next you select your bike – just like picking a seat on an airplane or at a concert. 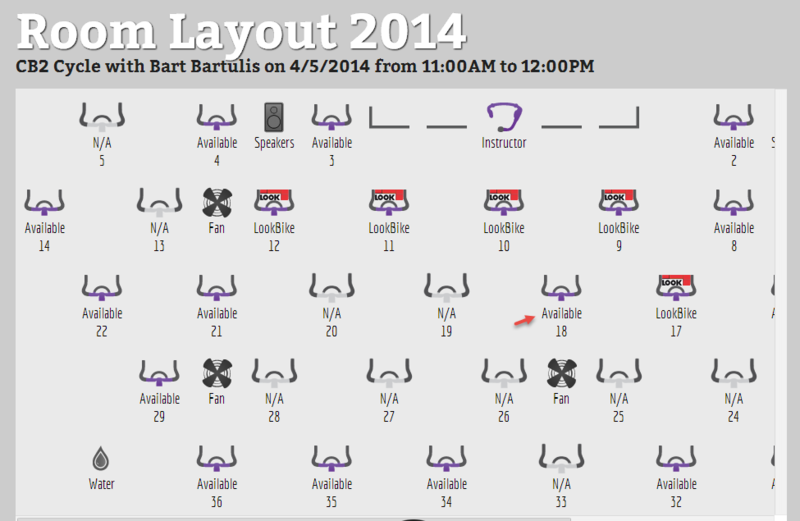 The image is for Bart's 11:00 am class. Note how you can pick a bike that has your type of pedals. Once you've completed your purchase you receive a conformation email – all this happens automatically. Having a confirmed seat, in a sold out class, is awesome. A friendly reminder is appreciated by scatter brains like me. After the class I checked my email and saw all of my performance data. I wasn't wearing a heart rate strap in this class. If I had that data would show as well. Receiving this information had me wanting to return to see if I could improve my average. Amy and I were very impressed by this system and feel it will really get your participants excited about training with power on a consistent schedule! The website integration system is offered by LiveEdit and will work with these Indoor Cycles with power; FreeMotion S11.9, Spinner® Blade Ion and the Schwinn AC Performance. BOOK YOUR BIKE, has definitely been an incredible asset to our studio. 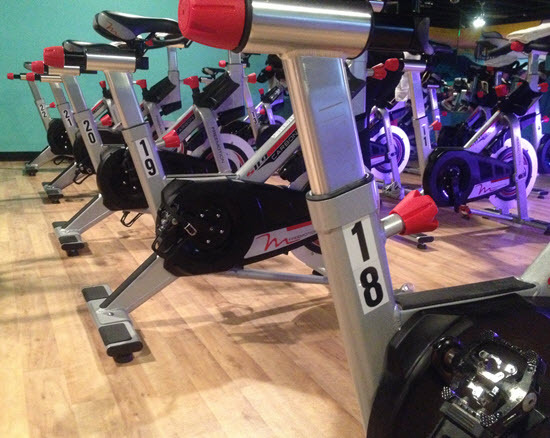 I can’t imagine an indoor cycling studio NOT having it!! !